This week has been an interesting one. And when I say interesting, I mean rainy…really rainy. So what do you do when it’s raining and you have very little money? Why, go to a free museum of course! 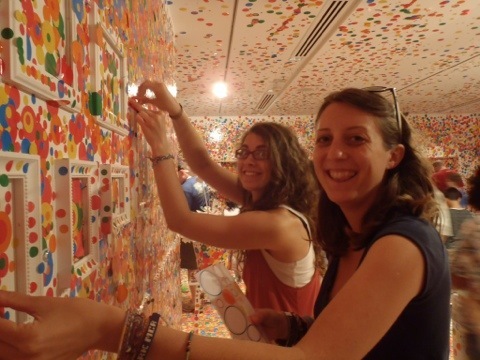 The Gallery of Modern Art in Brisbane (or GoMA for short) is a pretty cool place, with plenty of entertaining exhibitions, including this particular one above, by artist Yayoi Kusama …although it did feel like we were doing the art work for her…they give you a bunch of coloured sticker dots and you get to stick them wherever you like in the (previously) white room. Pretty mental! That looks like awesome fun! I’ll have to head across to GoMA this week so I can play with spots and check out the Matisse exhibition. yeah it’s definitely worth the trip!